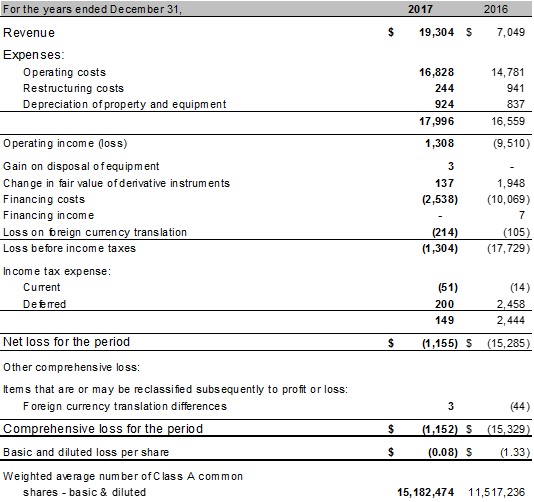 DENVER – February 22, 2018 (TSX: IMP) (ITMSF:BB) – Intermap Technologies Corporation (“Intermap” or the “Company”) reported a 174% increase in 2017 revenue and a $11.6 million improvement in cash from operations, compared to 2016. In addition, it reported positive net income for the fourth quarter. The Company also announced today the receipt of a new $2.0 million government task order for the creation of digital elevation and bare earth terrain models. The Company is increasingly providing its multi-sensor solutions and data management tools through web services, software and analytics. Including this announcement, the Company has announced $3.7 million of government task orders since year end 2017, which are to be completed in 2018. Consolidated revenue for the year ended December 31, 2017 totaled $19.3 million, compared to $7.0 million recorded in 2016. Approximately 65% of consolidated revenue was generated outside the United States, compared to 30% for the same period in 2016. Total revenue for the fourth quarter increased 297% to $5.9 million, compared to $1.4 million for the fourth quarter of 2016. 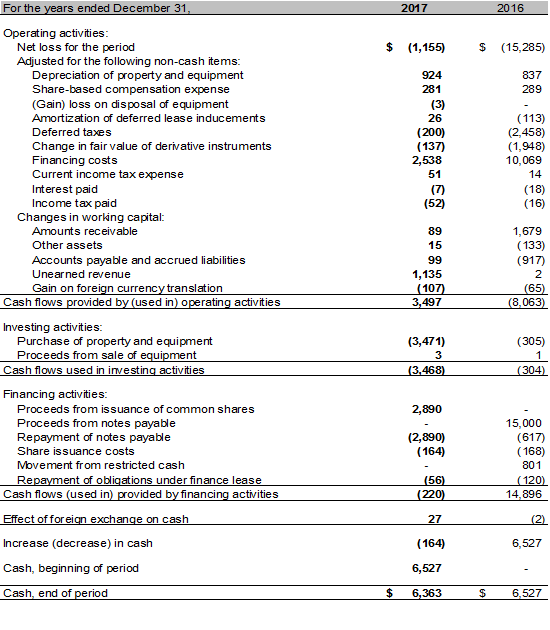 Operating cash flow for the year was $3.5 million, compared to an $8.1 million loss in 2016. 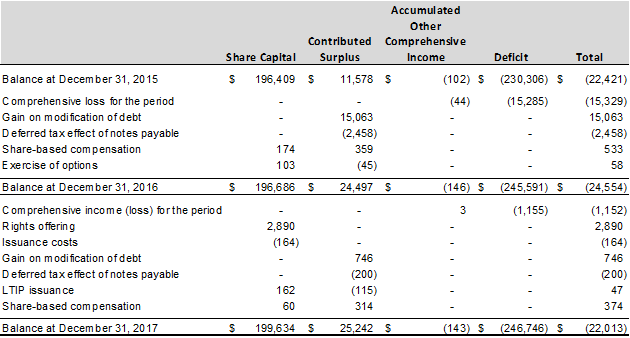 Operating cash flow for the quarter was $0.9 million, compared to a $1.3 million loss for the same period in 2016. 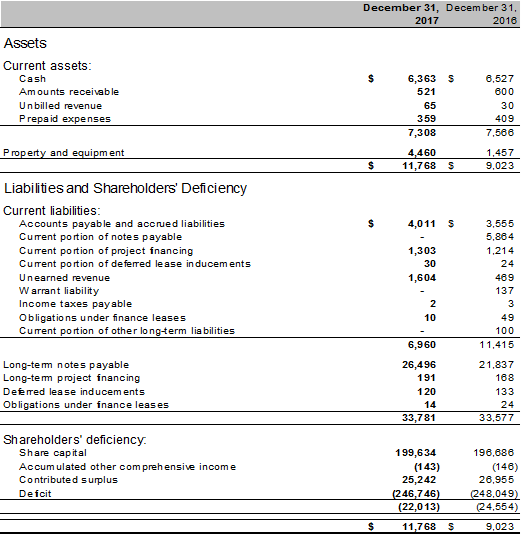 Adjusted EBITDA, a non-GAAP and non-IFRS financial measure, was positive $3.5 million for the year, compared with negative $7.2 million for 2016, a $10.7 million improvement. Fourth quarter adjusted EBITDA was positive $1.9 million, compared to negative $0.8 million for fourth quarter of 2016. For the fourth quarter of 2017, Intermap reported net income of $0.5 million, compared to a net loss of $0.2 million for the same period in 2016. The Company finished the year with $6.4 million of cash and positive working capital of $0.3 million, compared to cash of $6.5 million and a working capital deficit of $3.8 million for 2016. In addition to generating cash throughout the year, the Company invested $3.9 million in new sensors, software, and other proprietary technologies, compared to $0.3 million of investment during 2016. Total assets increased to $11.8 million, up from $9.0 million at the end of 2016. The Company’s total assets exclude its proprietary, high resolution, NEXTMap® data library, as well as internally developed software applications, patented algorithms along with innovative approaches in artificial intelligence and machine learning-driven processing engines, risk models, and prototype sensors. Cumulative net operating loss carryforwards at the end of 2017 totaled $223 million. The Company also commenced a complete upgrade of its internal processing, data management, optimization and software architecture, incorporating graphic processing units; auto-classification, automated feature extraction and data authoring; artificial intelligence and machine learning algorithms; and a patented intelligent resolution improvement process. The Company’s Annual General and Special Meeting of Shareholders is scheduled for March 15, 2018 in Calgary, Alberta. The materials are available on SEDAR at: www.sedar.com. In advance of the meeting, the Company has entered into a voting agreement with Vertex One Asset Management (“Vertex”), in which Vertex intends to support the matters to be put before shareholders at the meeting.